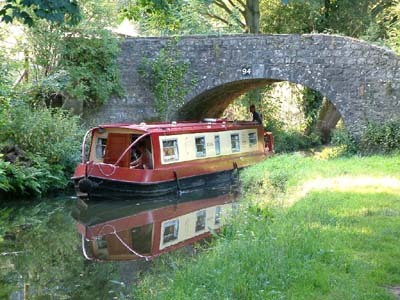 Take things easy by hiring a narrow boat and take a relaxing canal trip along the Welsh Brecon and Monmouthshire canal. Nothing can be more peaceful than to sit on the deck of a canal barge as it drifts slowly along these old waterways. In today’s modern, stress driven working week it is ever likely that when people take a holiday and the canals provide the perfect calming way to kick back, take stock and relax. To recharge the batteries and get away from it all. Well if you fall into the later category you should give a canal barge holiday a whirl. Travelling at a break neck speed of 4 miles an hour through some of Britain’s most picturesque countryside, taking your time to appreciate the world around you rather than indulging in road rage and letting the scenery rush past. This is the perfect way to calm the corporate beast. At the beginning of the nineteenth century Wales was the world’s industrial powerhouse, the first industrialised country. These tranquil waterways were the M25 motorway of their day, linking the industrial centres around the country. They brought the raw materials and finished products to towns, cities and ports for distribution around the world. These days it is hard to imagine them as anything but a peaceful haven from the pressures of the modern age. Gone are the noxious, fume spewing iron works, the slag heaps and the lime kilns and in many instances the countryside has been reclaimed by mother nature. 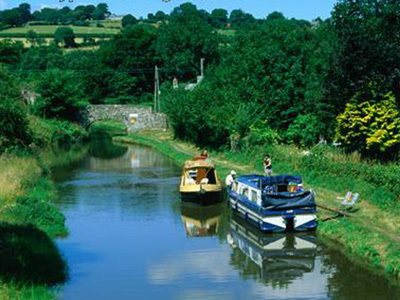 The 33 miles of Monmouthshire and Brecon canal provides the prefect escape solution. Set on the borders of the Brecon National Park, the canal was originally opened in 1797 with work finally reaching Brecon in 1800. The course from Pontymoel junction is level for the first 23 miles and then at Llangynidr raises through a flight of five locks. As you near Brecon the canal crosses the river Usk on the Brynich Aqueduct and then you travel through a half mile tunnel to reach the Theatre basin in Brecon. 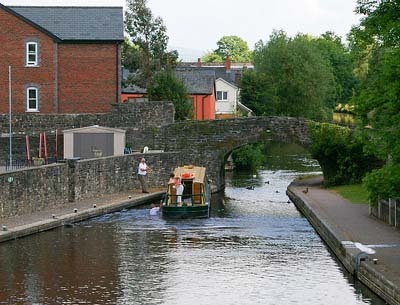 As you gently slide along the canal you can explore the market towns of Abergavenny with its museum and Norman Castle, pastural Crickhowell and Brecon with its Cathedral and Georgian splendour. The area you casually cruise through was once the heartland of the industrial revolution with the nearby steel producing towns of Ebbw Vale, Pontypool and Blaenavon with its world heritage blast furnace and the Big Pit Museum. All were linked to the canal by tramlines and the remnants of their loading wharves, coal basins and factories are now lie abandoned and scattered along the towpath, like ghosts from some past age. Much of the length of the canal winds its way through the reclaimed countryside of the Black Mountains and the Brecon Beacons, giving you ample chance to simply enjoy the beauty of the Welsh landscape. Going back in time, does not necessarily mean sacrificing your treasured crutches of the twenty first century as many of the modern barges and even the retro fitted old narrow boats are equipped with all the mod cons you expect to find. Despite the cosy surroundings these caravans of the waterways contain excellent kitchen facilities, central heating, showers or hip baths and TV, DVD players. Traditionally having between 4 and 8 berths, with either double beds, bunkbeds or foldaway beds, these compact but elegant craft are the perfect mobile getaway. This entry was posted in tours, Travel and tagged canal, canal barge, Canal Trips, Relaxing Holiday, Wales, Waterways. Bookmark the permalink.